Going “above and beyond” is something you rarely hear the nursing staff at ChildServe talk about, even though it is something they do on a daily basis. In fact, when you attempt to give them attention for their outstanding work, they refocus the conversation on their coworkers and the children they serve each day. Zach is a 20-year-old living in the ChildServe long-term care unit. After watching parts of the presidential debates in school, Zach wanted to help shape our country by voting in our presidential elections. However, voting in person on the November 8 election wouldn’t be an option for Zach since he uses a wheelchair and has restricted movement in his upper body. After ChildServe’s RN Care Coordinator, Ricki Borchert, heard about Zach’s request, she quickly took action to find out what solutions were available. Ricki worked to connect Zach with a local electoral official, as well as arrange transportation and care to help Zach get to and from the Johnston Public Library (an early-voting satellite location) on Friday, October 28. In our video interview with Zach (below) on his voting day, he had some advice for those of us who are getting ready to vote. Zach sees it as part of becoming a responsible adult. Caring for the needs of children and young adults like Zach is part of Ricki’s job description, and Ricki tends to treat the children like she would her family. As an RN Care Coordinator on the CCU, she spends her days acting as a liason between families and children, physicians, school administrators, and ChildServe team members like CNAs, nurses, therapists, and social workers. Marie Porter, the Inpatient Unit Supervisor who has worked with Ricki for 13 years, claims that ChildServe’s Care Coordinators play a special role in fulfilling our mission to partner with the families to help children with special healthcare needs live a great life. Ricki in turn attributes ChildServe’s special nurturing environment to her many coworkers. “I feel like we all go above and beyond to not only meet their physical needs but all their needs so they can live a great life- like it says in our mission,” said Ricki. Partnering with families enables ChildServe to take patient care to a level beyond high-quality physical care. On a day-to-day basis, teamwork creates opportunity to develop care plans for children with a holistic approach. “We work together to problem-solve issues and make sure they’re getting everything – not only clinically, but we make sure they have fun too,” said Ricki. 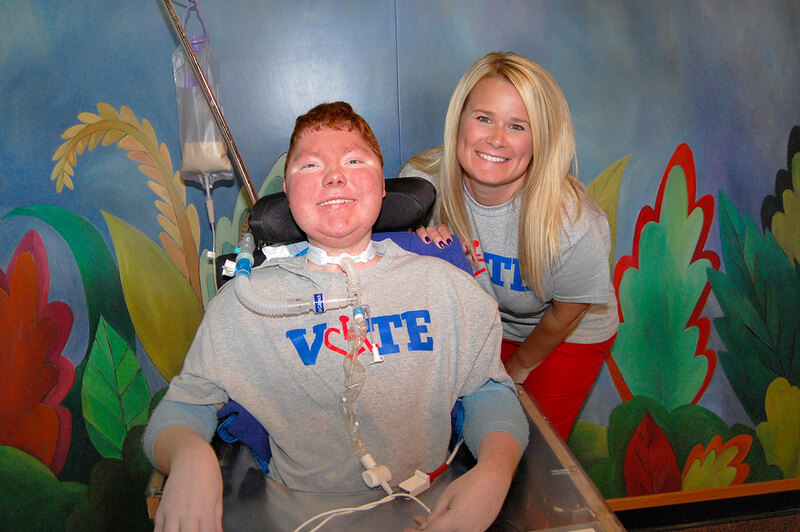 The long-term care team was excited and proud of Zach, especially the fact that he came up with the idea to vote on his own.